The Brown trout displays widely divergent life history strategies involving, variously, usage of streams, rivers, lakes, estuaries and the sea. The sea trout is the full sea-going form, it is very common and competes with salmon for the position of the most sought after migratory salmonid in many countries. Its use of freshwater, estuaries and coastal waters gives it a unique position as a sentinel species of environmental quality across these habitats. Fisheries scientists and managers, fish biologists, aquatic biologists, ecologists, members of fish and wildlife agencies, government departments and libraries in universities and research establishments where fish and fisheries are studied and taught will find this book a fascinating exploration of the species and a valuable reference tool. Opening address 1. Carwyn Jones. Opening address 2. Helen Philips. 1. Sea Trout Setting the Scene: G Harris and N Milner. SECTION 1: Stocks and Fisheries. 2. Anadromy & Migrations of Pacific Salmon & Trout: T.P. Quinn & K.W. Myer. 3. A Review of the Status of Irish Sea Trout Stocks: P.G. Gargan, R. Poole & G. Forde. 4. Characteristics of the Sea Trout (Salmo trutta) Stock Collapse in the River Ewe (Wester Ross), Scotland, in the Late 1980s: J.R. Butler & A.F. Walker. 5. Characteristics of Sea Trout (Salmo trutta L.) Stocks from the Owengowla & Invermore Fisheries, Western Ireland, and Recent Trends in Marine Survival: P.G. Gargan, W.K. Roche, G.P. Forde & A. Ferguson6. Annual Variation in Age Composition, Growth & Abundance of Adult Sea Trout Returning to the Welsh Dee: 1991 – 2001: I.C. Davidson, R.J. Cove & M.S. Hazlewood. 7. Structure & Composition of Sea Trout Stocks of 16 Rivers in England & Wales: G.S. Harris. 8. The Rod and Net Sea Trout Fisheries of England & Wales: R. Evans. & V Greest. 9. General Overview of Turkish Sea Trout (Salmo trutta) Populations: I. Okumus, S.Temel & S. Atasaral. 10. The Status of Fishing of Sea Trout on the Finnish Coast of the Gulf of Bothnia in the Baltic Sea: E. Jutila, A. Saura, I. Kallio-Nyberg, A. Huhmarniemi & A. Romakkaniemi. 11. Sea Trout (Salmo trutta L.) in Atlantic Salmon (Salmo Salar L.) Rivers in Scandinavia & Europe: N.J. Milner, L. Karlsson, E. Degerman, A. Jholander, J.C. MacLean & L-P. Hansen. SECTION 2: Genetics and Life History. 12. The genetics of Sea Trout, with particular reference to Britain and Ireland: A. Ferguson. 13. Differences in Global Gene Expression Levels between Sedentary & Migratory Forms of Brown Trout: Giger. T. L. Excoffier, P.R.J. Day, A. Champigneulle & C.R. Largiadèr. 14. Life Histories of Sea Trout: B. Jonsson and N. Jonsson 15. Migration as a Life History Strategy for Sea Trout: D. Solomon. Fisheries Consultant, Salisbury, Wiltshire, England. 16. Life History of a Sea Trout Population (Salmo trutta) from the NW Iberian Peninsula (River Ulla, Galicia, Spain): P. Caballero, F. Cobo & M.A. González. 17. Applications and future prospects for genetic analysis in salmonid biology: M. W. Bruford. SECTION 3: Populations Dynamics, Ecology and Behaviour. 18. A 35-Year Study of Stock-Recruitment Relationships in a Small Population of Sea Trout: Assumptions, Implications & Limitations for Predicting Targets: J.M. Elliott & J.A. Elliott19. Characteristics of the Burrishoole Sea Trout Population: Census. Marine Survival & Stock Recruitment: R. Poole, M. Dillane, E. deEyto, G. Rogan & K. Whelan. 20. Population Dynamics of Sea Trout in the River Bresle, a coastal chalks stream in Normandy, France: G. Euzenat, F. Fournel, & J-L.Fagard.. SECTION 4: Managing Stocks and Fisheries21. The Spawning Requirements of Sea Trout: A Multiscale Approach: A.M. Walker, & B.D. Bayliss. 22. Research Activities & Management of Brown Trout (Salmo trutta L.) in Denmark: G.H. Rasmussen. 23. Stocking Sea Trout (Salmo trutta L.) in the River Shieldaig, Scotland: D.W.Hay & M.A. McKibben. 24. Are Reared Anadromous Brown trout Compatible with the Conservation of Wild Trout? : H. Lundqvist, S.M. McKinnell, S. Jonsson & J. Östergren. 25. Sea Lice Lepeophtheirus salmonis Infestations of Post-Smolts in Loch Shieldaig, Wester Ross: 1999-2003: M.A. McKibben, D.W. Hay, A.F. Walker & S.J. Northcott. 26. Comparison of Survival, Migration & Growth in Wild, Offspring from Wild (F1) and Domesticated Sea Run Trout (Salmo trutta L): S. Pedersen, R. Christiansen & H. Glüssing..
27. The Rapid Establishment of a Resident Brown Trout Population from Sea Trout Parents Stocked in a Fishless Scottish Stream: A. F. Walker. 28. Predicted Growth of Juvenile Sea Trout & Salmon in Four Rivers in England & Wales Based on Past & Possible Future Temperature Regimes Linked to Climate Change: I.C. Davidson & M.S. Hazelwood. 29. Sea Trout Exploitation in Five Rivers in England & Wales: B.A. Shields, B. Bayliss, I. Davidson & P. Elsmere. 30. Catch-&-Release, Net Fishing & Sea Trout Fisheries Management: D. Solomon & M. Czerwinski. 31. A review of the statutory regulations to conserve sea trout stocks in England & Wales: G.S. Harris. 32. An appreciation of the social and economic values of sea trout in England & Wales: P. O’Reilly and G. Mawle. 33. Sea trout fisheries management: should we follow the salmon? : Walker, A.M., M.G. Pawson & E.C.E Potter. 34. 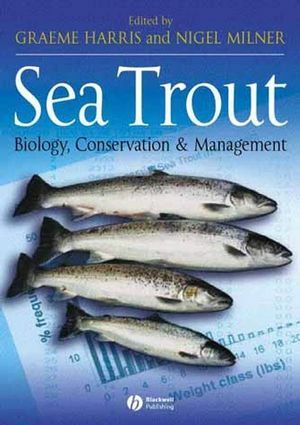 Perspectives on sea trout science and management: N. Milner, G.S. Harris, P. Gargan, M. Beveridge, M.G. Pawson, A. Walker and K. Whelan.